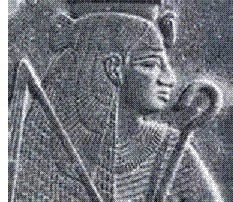 Pharaoh Neco II - The last significant pharaoh of ancient Egypt who played an important role in the Old Testament. He intervened in the political affairs of Judah and tried to assist Assyria against Babylon after Nineveh fell in 612 B.C.. But his army was wiped out by Nebuchadnezzar at the Battle of Carchemmish in 605.